HALF OF ADULTS own a bike but fewer than one in ten cycle every day, according to new figures released as part of National Bike Week. Furthermore, three out of every four people who cycle every day in Ireland are men, according to the stats from the Department of Transport. The survey covered a wide range of bike-related questions, from what we wear when cycling to when we first learned to cycle a bike. Most people enjoy using bikes for leisure rather than out of necessity according to those surveyed. Only 14% of those surveyed enjoyed commuting by bike the most, with 74% of people saying they preferred cycling for leisure or recreational purposes. Six in ten people say they cycle for fitness and health reasons, with 35% saying they do it to help the environment and 22% of people saying it helps to improve their mood and clear their head. There is a proliferation of bikes in a lot of Irish households, with almost half of all homes having two bikes or more. In terms of taking precautions when cycling, there were low numbers of people wearing cycling specific clothing, with only 13% of survey respondents saying they did so. Only 41% of people wear lights, 39% wear helmets and 29% wear reflective gear according to the survey. Dublin had by far the highest number of daily cyclists, at 15%, with other regions of the country having much lower figures. Only 5% of people in Munster reported cycling daily. The stats were compiled by Amárach Research using a sample of 1,000 people. 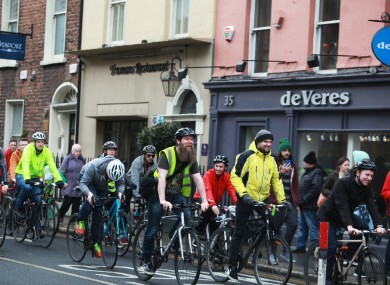 At the launch of National Bike Week, Dublin Cycling Campaign’s Colm Ryder told TheJournal.ie that some people are wary of cycling in the city because they believe it can be dangerous. “A lot of people will not get on bikes,” he said, “because they perceive it’s dangerous to cycle in the city”. We definitely want more and better quality routes so it can be ensured that cyclists stay safe around the city. Plans are already well underway from Dublin City Council (DCC) to restrict traffic from cars in many areas of the city. These plans include a civic plaza at College Green and the Liffey Cycle route, which see a continuous cycle path along the River Liffey, from Heuston Station to Dublin’s docklands and, in parts, incorporate a dedicated cycling boardwalk. Email “Three out of every four people that cycle every day in Ireland are men”. Feedback on “Three out of every four people that cycle every day in Ireland are men”.